The great wide world of marketing is something that many people know something out, but it’s very rare to find someone who knows everything. In fact, I’d go so far as to say it’s impossible. Marketing is a huge field with a lot of opinions and ideas, some of which work and some don’t. you can follow the best advice out there but it might not work, or follow none of it and see great results. What amazes us is that there is still a large portion of people who believe and perpetuate some ideas about marketing that have been proven to be completely false. These can at best leave customers with unrealistic expectations and at worse cause some serious harm to their business. So naturally, we wanted to bust some of them for good and sort the fact from fiction. This is by definition untrue. Content creation is the act of conceptualising and creating content (fairly self-explanatory), whereas inbound marketing encompasses all marketing activities that bring visitors in, as opposed to having to go out and get prospects attention (outbound marketing). Inbound marketing earns the attention of customers, makes the company easy to be found and draws customers to the website by producing interesting content. Obviously creating content is a very important part of this and will help to give your customers the information they want and establish you as an expert, but just creating more content alone won’t bring you results. It needs to be combined with your web design, SEO efforts, your social media presence and interaction, email marketing, marketing automation and conversion process in order to be effective. Content is really only 1 part of the puzzle. Yes, having a website is really important and it’s a vital first step, but that alone won’t get you customers. Let’s get rid of this ‘build it and they will come mentality once and for all. It only worked in Field of Dreams anyway. Nothing in marketing works in isolation, instead relying on complementary efforts to produce results. If you simply build a website and leave it there, you won’t see any results –we’d be willing to put money on it. You have to put yourself out there and promote for people to notice you above the throng of thousands of other businesses competing for your prospects attention. If you are not using other marketing and advertising tools to put yourself in front of them, it is impossible for you to be found and generate sales. Unfortunately, it’s no longer good enough to simply have a pretty website, you’ve got to know how to use it too. This ideology is nothing short of insane. Marketing costs money, so if you’re just doing something because it fulfils the mandate for ‘doing marketing’, you are literally just throwing money away. Before you start saying yes to the first thing that comes along you should be doing research to figure out which marketing efforts will bring you the highest ROI. You need to define and hone your message and brand identity, dedicate time and money to making sure your message is getting to the right people and the resources to monitor, evaluate and change the direction of your marketing to make it successful. If you aren’t able to do that then marketing is just a way to camouflage throwing good money out of the window. Marketing And Advertising Are The Same Thing, Right? WRONG! It’s amazing how often we still hear the terms marketing and advertising being used interchangeably as if they were the same thing. Let’s clear this up. Advertising means buying time or space to relay a message. Like buying a billboard on the side of the road or a prime time TV slot to run your advert. It is a part of something bigger. Marketing, on the other hand, is the act of moving a product from concept to customer delivery and drawing in those customers. This encompasses the ideas of your company, your brand, how you communicate, the design, processes, measuring of effectiveness and market research. In short, marketing is a bloated giant of a concept, while advertising is relatively straightforward and small part of it. Marketing activities can include blogs, email newsletters, customer research, cold calling, search engine marketing and so much more. For small and medium sized businesses, advertising is actually the worst performing form of marketing, because advertising is a mass market tool, whereas most small and medium sized businesses are aiming for a niche market. So instead, they employ wider marketing tactics to gain new customers and raise awareness. Marketing is a never ending task for every business out there, not least because there are so many options to try and avenues to go down. That’s why it’s important to take a measured view of your activities and understand how everything works and what it could do to your business. 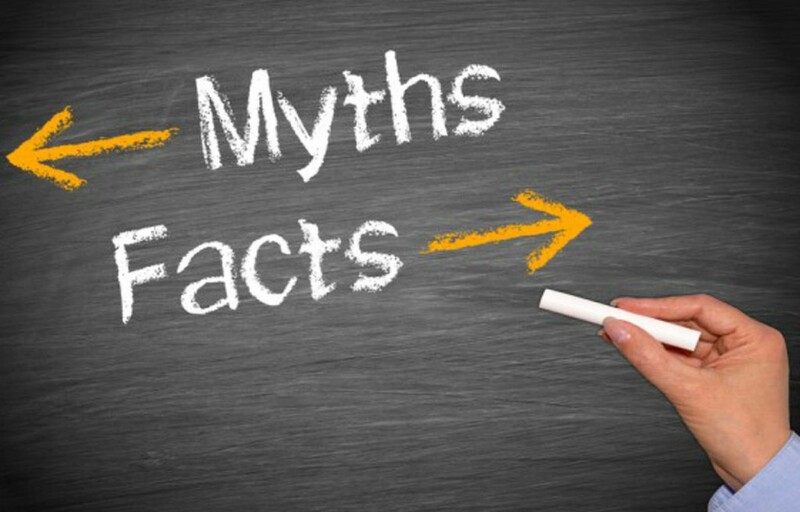 Hopefully shedding some light on these common marketing myths have helped to shape your ideas moving forward and will make your next marketing effort all the more successful. For more information on marketing myths and the truths behind them, or just to talk to us about your marketing strategy, get in touch today for your free consultation.